Cut the vanilla beans in half and scrape the vanilla seed out and put the seeds and pod in a sauce pan and add the 2 cups of milk. Heat the milk to a boil then put on low heat and simmer for 30 mins to let the vanilla flavour infuse in the milk. Strain the milk with a sieve into a bowl or glass measuring cup and put in the fridge and let cool for 20 minutes. Scoop out the avocado and put into the blender along with all of the other ingrendients and blend until smooth. 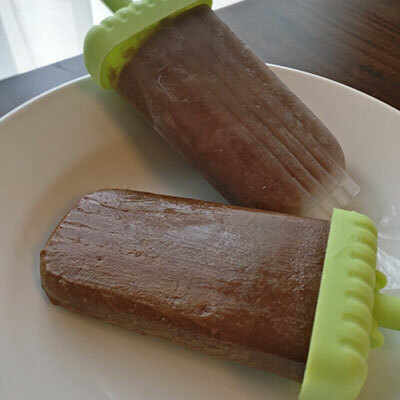 Pour the mixture into your popsicle molds and freeze for about 8 hours. You can adjust the amount of cocoa powder and milk to change up the flavour. You can use almond vanilla flavoured milk/beverage instead of the suggested milk with vanilla pod. You can also choose to skip out the espresso powder too.